This Project Management course is intended for managers and executives who need to acquire a high competency in project management, project control and documentation tools and processes. The course is compliant with the standard Project Management Body of Knowledge (PMBOK) of the Project Management Institute (USA). If you’re like most managers, you’re thrust into a leadership and managerial position to manage a project without ANY kind of tools or training. You’re left to figure things out on your own. Why re-create the wheel when there are frameworks and systems to help you guide a project (ANY Project) to success by following a set process. Instilling Project Management lifecycle, methodology and terminologies, and making it the backbone of any generic/IT/non-IT project organization. Clarifying the roles of senior management, project manager, team members and suppliers. Understanding stakeholder influences and resolving conflicts in a project. Knowing the delicate task of leading project teams including other project stakeholders. Knowing and applying skills in leading a project team, pacing the team through team development and motivating them, effective team communicating, as well making quick decisions. Conducting systematic and structured project scoping, scheduling and costing. Understanding why and how project feasibility studies are conducted. Making accurate task duration and cost estimations when using uncertain information – determining worst-case, best case and most likely case for task/project durations, and costs. Identifying and determining performance metrics for project tracking in a project. Tracking project progress and making project reports – using network, milestone and Gantt chart diagramming. Appreciating MS Project for planning, scheduling and tracking project progress. Understanding the use of problem-solving methodology in understanding, analyzing and problem resolution of issues in daily running of operations and projects. Being competent in applying problem-solving and decision-making techniques. Using Earned Value Management technique to analyze schedule and cost managementperformance of a project. Establishing a Project Management Office (PMO) and its roles. Simulating project risks and uncertainties using the Monte-Carlo technique. This is a useful tool for keeping track of your to-do lists for your projects. Get instant access to this tool when you download the course information kit. It gave me a wide range of tools and increased my confidence in my capability to manage projects. You are encouraged to bring your projects and cases to the session. The use of project management software and techniques will be used to help you better understand project management concepts. Project management documentation such as templates, forms and checklists are provided in the course material, and are downloadable online; and the participant may freely use or modify them for use in his/her organisation. You are virtually getting personalised coaching in addition to the training. Have comprehensive understanding of the various processes of project management. Have comprehensive application knowledge about the Project Management Body of Knowledge (PMBOK). Have an advanced set of project management tools and techniques for immediate project application at the workplace. Gain an appreciation of the importance of a collaborative “win/win” negotiation process. Gain a clear understanding of why communication is so important-regardless of how a project is organised. Discover how business and personal ethics can influence the leadership style and personality, and how his/her own individual leadership style and personality can influence the course a project will take. You will have a ready set of working templates, forms and checklists relevant for use in projects at their place of work. This course is suitable for you if you are directly involved in executing, planning and implementing any kind of general and IT projects, or setting up a Project Management Office, and those requiring an advance set of tools to assist in cost estimation, cost tracking, procurement, contract, risk assessment and management, quality control and scope verification. This course is perfect for you if you have some or no prior project management knowledge. If you are a senior manager or professional who overlooks and supervises projects but do not need to know implementation tactics but want to have a higher-overview of managing and overseeing project, then the Strategic Project Management for Senior Managers is the right course for you. 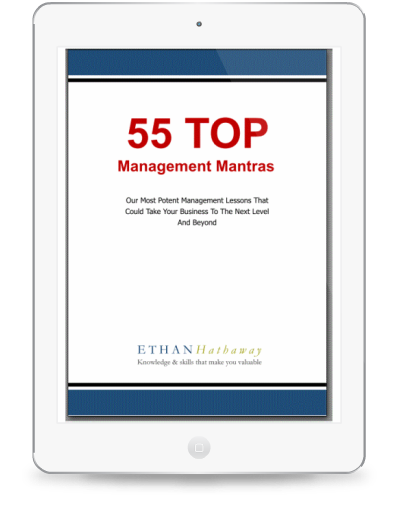 55 of our most powerful management tips collected in this useful digital guide. You also receive this handy reference book so you can refresh your project management skills anytime you want. We like to reward fast-action takers, so we’re paying for HALF your course fees if you enroll by the Super Early Bird deadline. You have unlimited access to the most updated course.